As expected, Intel revealed its new family of Core X enthusiast grade processors at Computex, while AMD revealed more details regarding Threadripper. 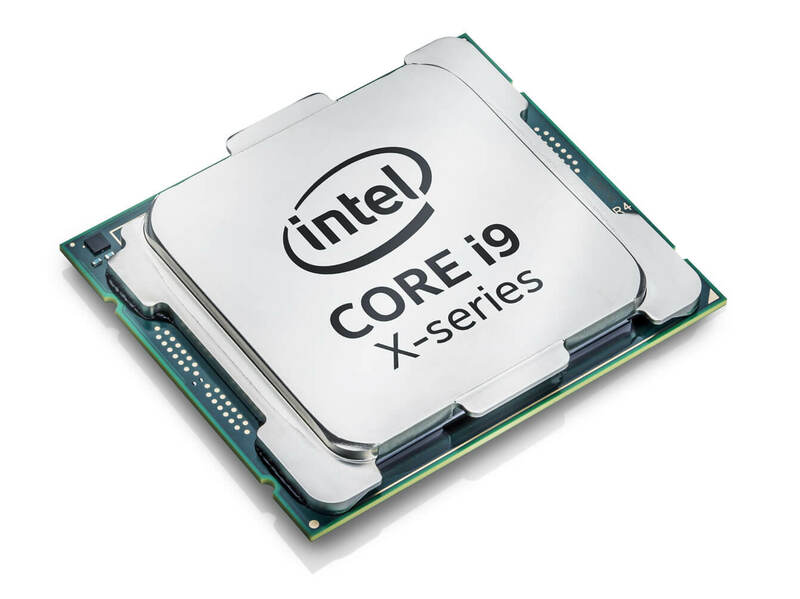 So let’s talk about the CPUs and make a few comparisons, though before we get too far into it please note we don’t have any official model names, clock speeds or pricing info for the Threadripper series, while the clock speeds for Intel’s higher-end Core i9 series is yet to be revealed as well. So on Intel’s side, sitting at the head of the family is their answer to AMD’s 16-core/32-thread Threadripper CPU: the eye-watering Core i9-7980XE -- and I say eye-watering not because it boasts an incredible 18 cores and 36 threads, but because it will set you back $2000. 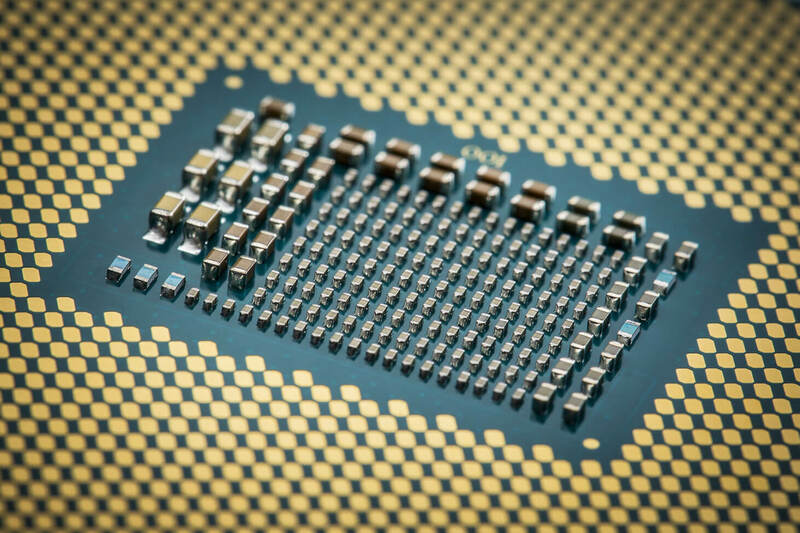 The price might be extreme even for the flagship model, but Intel will also be releasing 4, 6, 8, 10, 12, 14 and 16-core models, in what looks to be an outright assault on AMD. The Zen architecture has clearly lit a fire under Intel and all this competition is good news for us, the consumer. The Core X series includes both the Skylake-X architecture as well as the Kaby Lake-X architecture. All CPUs that have a core count of 6-18 cores are based on Skylake-X, leaving just the quad-cores to use Kaby Lake-X. AMD has already fired shots with their 4-core, 6-core and 8-core models and we are expecting 10, 12, 14 and 16-core versions soon. Not wanting to simply match AMD’s core count Intel has gone one step further with the Core i9-7980XE by hitting 18-cores. This is essentially the Titan XP of the CPU world, so it’s not really that relevant. Anyway if you have money to burn and the 18-core model is indeed worth whatever premium it ends up being over Threadripper, what does all that mola land you? Well, Intel says the i9-7980XE is the first ever teraflop desktop PC processor, so there’s that. You also get a CPU with a truly massive 18MB L2 cache. That is 1MB per core and then there’s a shared 24.75MB L3 cache. The operating frequency is yet to be revealed (base frequency) but using Turbo Boost Max 3.0 a core or two should be able to hit 4.5GHz. For such a monstrous processor you might be expecting a thermal design power rating in excess of 200 watts. But the good news is the TDP rating has been set at just 165 watts. That should make thermals quite manageable, but Intel is also selling its own liquid cooler designed for the 165W TDP and 140W TDP chips. It's estimated retail price is between $80 and $100, and will work with some previous generation CPU models as well. For those that can’t drop $2K on a CPU there’s the Core i9-7960X for a much more wallet friendly $1700 -- of course! What’s interesting here is that this model boasts the same core count as AMD’s upcoming flagship Threadripper CPU, rumored to be called Ryzen 9 1998X. All AMD Ryzen Threadripper CPUs will have quad channel DDR4 support as well as the full 64 PCIe Gen3 lanes. That is 20 more lanes than Intel’s highest end Skylake-X Core i9 processors and incredibly 40 more lanes than its 8-core and 6 core Core i7 models. So AMD has Intel against the ropes when it comes to PCI Express lanes, those X399 motherboards are going to be quite incredible. Intel says the i9-7980XE is the first ever teraflop desktop PC processor, so there’s that. So with the 8-core Ryzen 7 1800X at $500 and the 1700 model which is essentially the same thing that’s currently selling for as little as $310, how much can a 16-core Ryzen CPU really cost? It would have to be well over double the price of the most expensive 8-core model to come even close to the i9-7960X, so that’s something to ponder. Anyway, the Core i9-7960X will feature a 16 MB L2 cache, again 1MB per core, as well as 22MB’s of L3. Memory support is the same for all Skylake-X processors and remains at Quad Channel DDR4-2666. The TDP is also locked at 165 watt and again for now, the base clock of this model is yet to be announced. Intel says that compared to Broadwell-E chips such as the $1700 10-core i7-6950X, the new 10-core model offers 15 percent faster single thread performance and is 10 percent faster on multi-threaded tasks. So naturally for multi-threaded workloads the 7960X is going to crush the 6950X albeit for the same ludicrous price. Dropping down to the low, low price of $1400 we find the Core i9-7940X, a 14-core model with a 14MB L2 cache and a 19.25MB L3 cache. Again you get quad-channel DDR4 and the same 165 watt TDP. The 12-core Core i9-7920X comes in at $1200 and now we’re starting to nudge towards that original extreme price of $1000. With this one you get 12 MB of L2 cache with a 16.5 MB of L3 cache. The TDP has been lowered to 140 watts but you still get quad-channel DDR4-2666 memory support and all 44 PCI Express lanes enabled. Stepping in for my 6950X is the Core-i9 7900X, the new 10-core/20-thread model. This model comes in at the same price as the earlier Extreme Edition models such as the Core i7-965 Extreme Edition, so $1000. We know that this model will operate all cores at a base frequency of 3.3 GHz and that’s a nice little 10% boost over the 6950X. That said the new 7900X does only sport a 13.75MB L3 cache and that’s almost half that of the 6950X. However whereas the 6950X only has a 2.5MB L2 cache the 7900X has a huge 10MB L2 cache by comparison. L2 is considerably faster so having more should help boost performance substantially. Finally the 10-core model has been given the same 140 watt TDP rating as the 12-core model, quad-channel memory and 44 PCIe lanes. Okay, so this is where it gets really interesting, the 8-core/16-thread Core i7-7820X featuring an MSRP of $600. That means we are seeing a notable 40% reduction in price when compared to the 10-core model and just a 20% reduction in core assets. 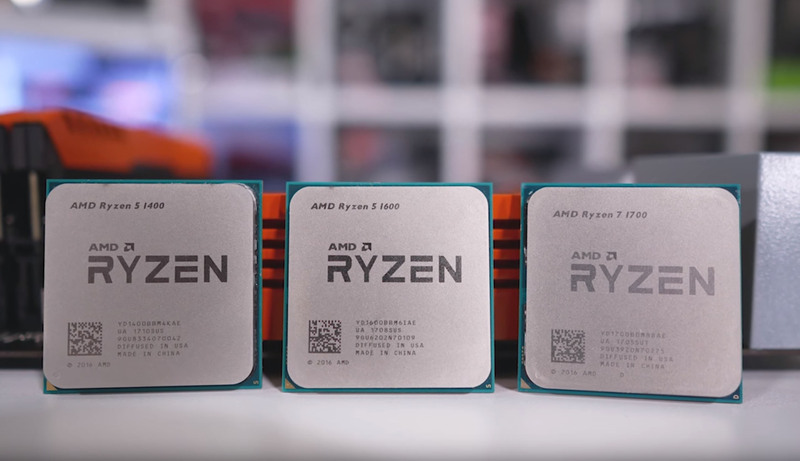 This also means that the 7820X will come in 20% more expensive than AMD’s Ryzen 7 1800X and awkwardly almost twice the price of the 1700 model, so it could be a good deal next to the 1800X, but unlikely to be with the existence of the 1700. It comes clocked at 3.6 GHz for all cores but can boost as high as 4.5 GHz. So that is a higher clock speed than what Ryzen can currently achieve. This is another 140 watt part but PCIe lanes have been reduced to 28, though this is still plenty for most power users. Still as noted earlier this is a massive 56% reduction in lanes when compared to even the base Ryzen Threadripper CPU. Now for the 6-core/12-thread model and Intel has a lot riding here. As you probably know the Ryzen 5 1600 is considered to be the golden chip of the entire Ryzen lineup and at just $220 it’s hard to beat. It seems like Intel’s not even going to try as their 6-core Core i7-7800X is set to come in at $390. That’s not a significant saving over the current 6-core Broadwell-E chip, about 10% cheaper when compared to the 6800K. This model can boost as high as 4GHz out of the box with a base clock frequency of 3.5GHz. It also packs 6MB of L2 cache and 8.25 MB of L3 cache. Again this is a 140 watt model with 28 PCIe lanes. With the 6-core model still coming in at almost $400 that still leaves some room for some lower tier models. Intel is offering quad-cores on the X299 platform, the fastest of which will be the Core i7-7740X. Priced at $340 it comes in at the same price as the Core i7-7700K and this model is based on the new Kaby Lake-X architecture. I think most will agree with me though when I say, I don’t really get this model. It’s not a great deal cheaper than the 6-core model and yet it only offers dual channel memory support and a mere 16 PCIe lanes. Why offer such a measly CPU on a flagship platform that will no doubt be dominated by premium and expensive motherboards? It’s almost a joke that the entry level Threadripper CPU will support three times as many PCI Express lanes. As you probably know the Ryzen 5 1600 is considered to be the golden chip of the entire Ryzen lineup and at just $220 it’s hard to beat. Perhaps even more puzzling is the $240 Core i5-7640X which is another quad-core part, though it lacks Hyper Threading support so just 4-threads are on offer here. So for $20 more than the Ryzen 5 1600, Intel is giving us a traditional Core i5. I won’t bother reading out the specs, I’m pretty sure this is going to be another Core i3-7350K situation where I'll simply tell you guys, don't buy it. 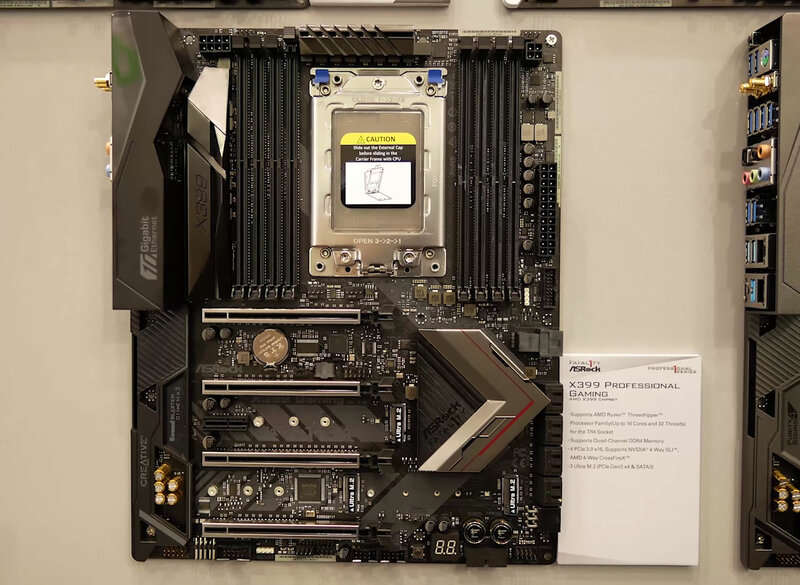 Before wrapping things up I checked out two X399 motherboards over in the Asrock booth. 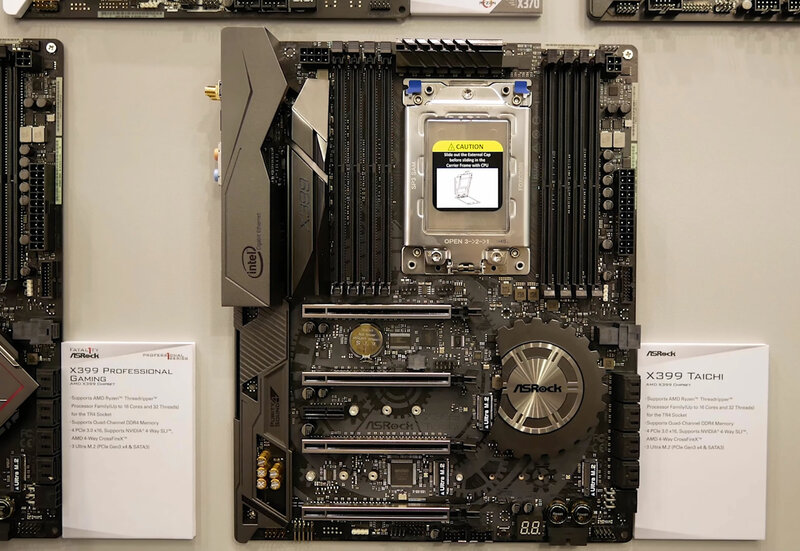 The first is the X399 Taichi and this board does a pretty good job of trying to tackle all those PCIe lanes with four PCIe x16 slots and three M.2 slots. As you can see that massive TR4 socket occupies a huge amount of space on the board, as do the 8 DIMM slots. 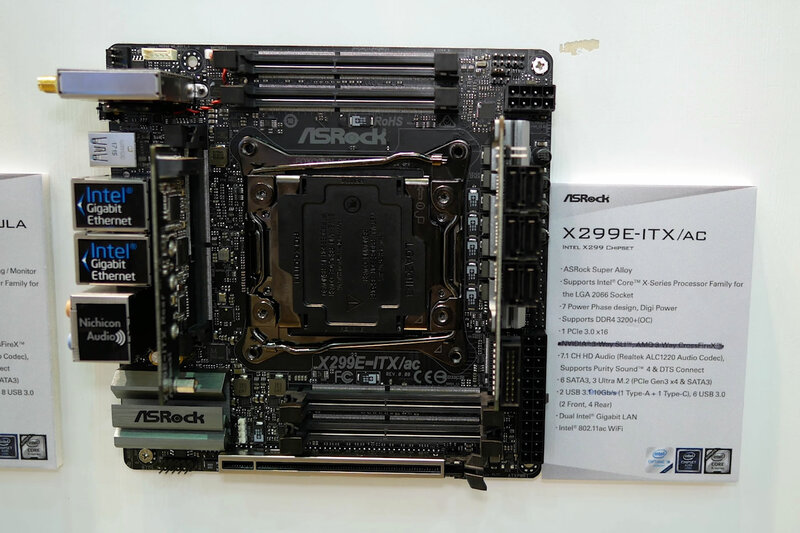 Asrock also had their X399 Professional Gaming on display and the core specifications were very similar though this board does pick up a Creative audio solution and 10 gigabit Ethernet which is very cool. I also spotted this Mini-ITX X299 motherboard. Looks like you'll be able to make an 18-core Core i9 rig in a shoebox size PC if you want. This tiny board wasn’t light on features either offering six SATA ports, three M.2 ports -- I know, three on a Mini-ITX board. There’s also loads of USB ports, numerous networking options and support for quad-channel memory via four laptop style DIMM slots. Impressive stuff and I can’t wait to check these new boards out when time comes. 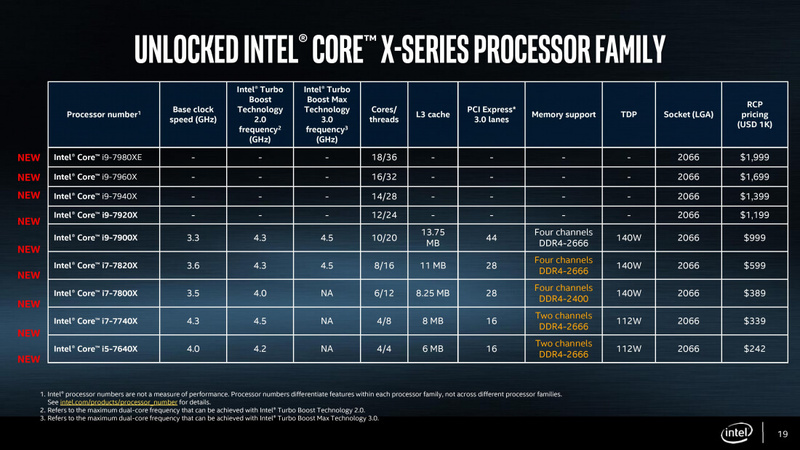 In a nutshell, Intel’s new Core X series certainly looks very interesting and a bit confusing at the same time. They are clearly feeling the Ryzen heat and going with an all-out assault. The release date for the first wave of chips is June 19 and I should have on hand for testing the 10-core Core i9-7900X and 4-core Core i7-7740X. Those i9 CPU's are just Xeons with different name. You forgot one crucial thing: Intel CPU's have thermal paste under HS, so except very high temps. Reehahs, rpjkw11, Kotters and 1 other person like this. "This is essentially the Titan XP of the CPU world, so it’s not really that relevant." Kind of. There will be higher core count CPUs for AMD and Intel, just that they will be targeted at servers. So I wouldn't expect thermals to be that great. I have no idea why Intel decided to do this when they didn't with previous gen chips (my 5820k machine is still a beast!). A 20c difference is really going to hurt these new chips in comparison to AMD's. Reehahs, rpjkw11, psycros and 1 other person like this. It kind of looks like Intel ISN'T taking Ryzen into account at all.... Releasing their new lineup with pricing that seems completely ridiculous - but only if you take Ryzen into account. Looks like Intel might be experimenting with this lineup.... If sales aren't affected, then they can keep doing the same old thing.... Let's hope this new lineup bombs, forcing Intel to actually release cheaper parts. Agnomen, Reehahs, rpjkw11 and 4 others like this. Agnomen, Forebode, Reehahs and 5 others like this. Why do all the tech sites act like Intel magically whipped up these new high-end chips in the time since Ryzen specs were announced? Kaby Lake was the rehash to stall for time - these new chips have probably been in the work for three years. Sadly, it seems that Intel still can't get their prices under control so I have real doubts about the short-term impact of Core X. The best case is probably reduced prices on the more powerful CPUs we've been using for the past five years. Agreed this was in the works for years. Only people that don't follow this industry would think they went into a backroom and made these in a month. So very surprising from most of the tech sites. Also when you are top dog you don't have to get "your pricing under control" They will price it at what they want and people will buy. Thats the power you get when you are number 1 in the market. You don't see apple struggling to get their prices under control, because they don't have to. Core X!? Bwahahahahaha, Intel needed a lean and mean sounding name for their latest Core i7? The marketing department must have been sweating cold for a while. Am I the only one here expecting Linus Tech Tip video testing of 18-core i9 pair with 2x Titan-XP coming pretty soon? But but but, no 20 core CPU in the list. I was going to rob a bank and have one of those bad boys ASAP. I can live a few more years outside of prison. Thanks Intel! The peer pressure of not having one would have been too much. Raoul Duke, Reehahs and tomkaten like this. Not sure what you are complaining about, I have presented to you all the information both AMD and Intel gave us. I'm really not complaining about you, it's about Techspot's policy...There's a lot of data in the presentation Lisa Su and others gave at Computex and this site never mentioned it or gave a link to. Very risky and warranty is gone. The Article should have been called "Introducing Intel's I9 lineup". Not much of a comparison with AMD's product. "very risky" is a bit wrong. Tools exist to do it on LGA 11x chips, from ivy to kaby. It wont be long until a tool for core X exists too. That being said, it shouldnt be needed. Intel cheaped out on these, no excuse. Reehahs and mosu like this. Yes but you failed to put it into the context of "Intel's failure to compete with the over whelming superiority of AMD's CPUs." If you need help in the future to properly write an article for fan boys I suggest looking up "alternative facts", "Russian Media", or any post by HardReset for some examples. Yes but you failed to put it into the context of "Intel's failure to compete with the over whelming superiority of AMD's CPUs." That would have made him delusional. 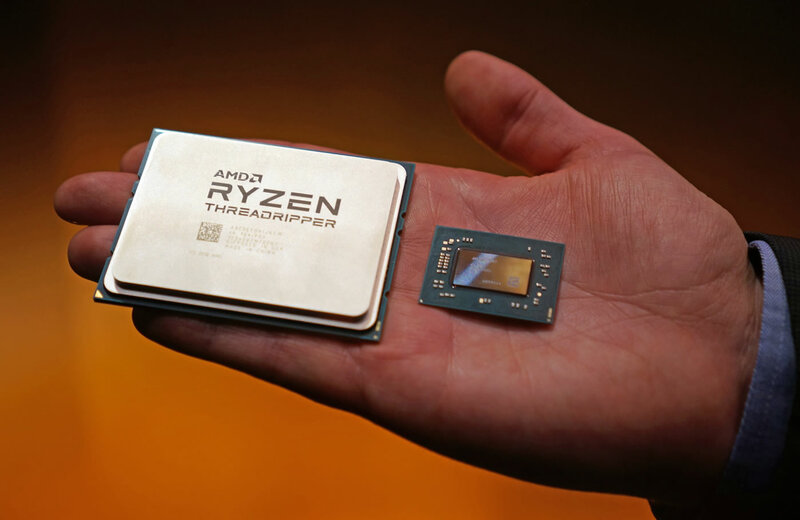 My god the size of that Threadripper CPU in that person's hand, I wonder if he will need some surgery on their wrist from it..
Raoul Duke and Shadowboxer like this. Wait Intel's new 16-core is only 10% faster than their old 10-core? Well engineering F'd up big when it didn't properly prepare for Zen. Leaks from insiders literally state that the CEO and upper management just assumed that Zen wouldn't be able to compete. They were completely asleep at the wheel. Now it's time for the marketing department to do the usual damage control while the engineers unlock and rebrand Xeon's as "i9's" and cobble together mainstream options for their previously HEDT platform. I say "Previously" because it's clear Intel intends for this to become a mainstream platform in order to compete with Zen. Intel has nothing to fear by being behind (if that is even what you can call this) for one generation. If anyone thinks Intel is afraid, they are sadly mistaken. Can you imagine the processing power, if Intel decides to put out a package the size/TDP of this monstrosity AMD has? If you want to support AMD, then fine so-be-it. But you can do so without looking to throw stones at the top dog. This will only result in asking for your own face to be slapped. Look at the size of that Ryzen monster! Interesting read but I only really game, so it's sort of like a race car driver looking at some big new trucks! AMD Ryzen 5 1600 vs Intel Core i7-7800X: 30 Game Battle!